Dogs truly are man’s best friend, but this bond isn’t isolated to your home. Dogs also make great companions on the trail. Hiking with your dog is a little different than going it alone on the trail. There are a few important things you’ll want to keep in mind to make the activity less stressful on both of you. You’ll want to make sure to match a trail with your dog’s abilities. Some people just don’t possess the physicality to endure certain trails, and the same goes for dogs. Terrain, obstacles and potential hazards like poisonous plants or animals are all things to consider when deciding on a trail for your dog. Not all trails and parks allow dogs, so be sure to check the dog regulations of a given park or trail beforehand. Some might also require permits or extra fees for dog access, so make sure to take care of those ahead of time. Paying fines is never fun, but doing a little prep work ahead of time will ensure that neither you or your dog have a frustrating day. Dogs like to work and be active, so taking advantage of such a seemingly endless amount of energy isn’t a bad idea. I’ve yet to meet a dog that didn’t like to chase a stick or a tennis ball, so keeping such a toy on hand is a great way to help your dog spend some of their energy in a healthy way. Also, equipping your dog with a pack—the Ruffwear Approach Dog Pack is a good option—is a great way to put them to work on a hike. 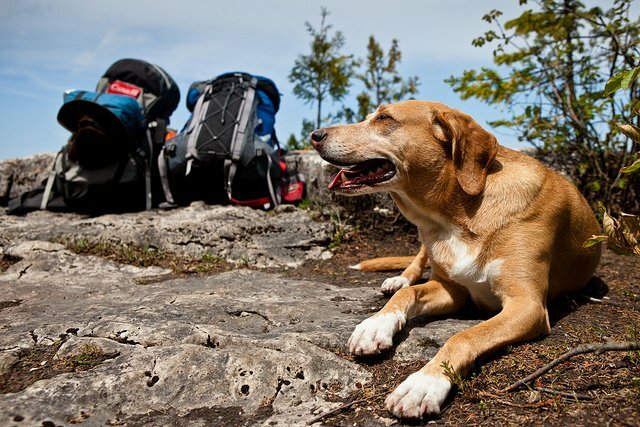 These packs can carry all of your dog’s essentials, as well, including water and treats. Choose the pack that fits your dog securely and holds most of the accessories you’ll be taking along with you. Hiking with a dog entails remaining aware of what’s going on around you, as well. Believe it or not, some people don’t like dogs. Gasp! That being said, keep your dog leashed when others are around, especially at campsites. Not only is this respectful, but it also reduces the risk of any potential incidents. Furthermore, if your dog is a barker, it might be best to have them wear a muzzle if you’re hiking or camping in popular locations.